The Cadaver Tomb of René of Chalon (French : Transi de René de Chalon, also known as the Memorial to the Heart of René de Chalon or The Skeleton) is a late Gothic period funerary monument, known as a transi , in the church of Saint-Étienne at Bar-le-Duc, in northeastern France. 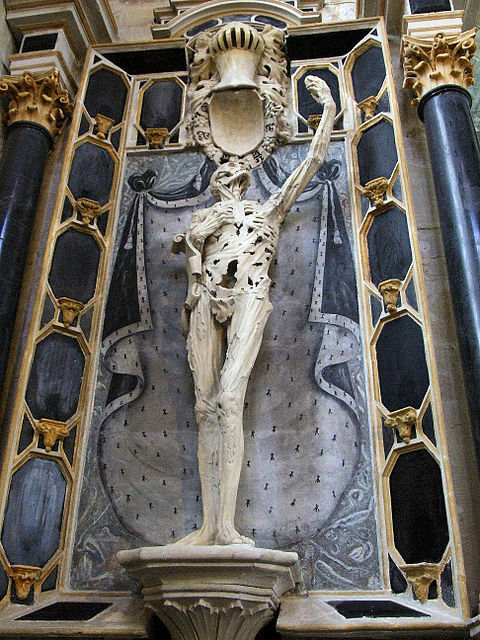 It consists of an altarpiece and a limestone statue of a putrefied and skinless corpse which stands upright and extends his left hand outwards. Completed sometime between 1544 and 1557, the majority of its construction is attributed to the French sculptor Ligier Richier. Other elements, including the coat of arms and funeral drapery, were added in the 16th and 18th centuries respectively. The tomb dates from a period of societal anxiety over death, as plague, war and religious conflicts ravaged Europe. It was commissioned as the resting place of René of Chalon, Prince of Orange, son-in-law of Duke Antoine of Lorraine. René was killed aged 25 at the siege of St. Dizier on 15 July 1544, from a wound sustained the previous day. 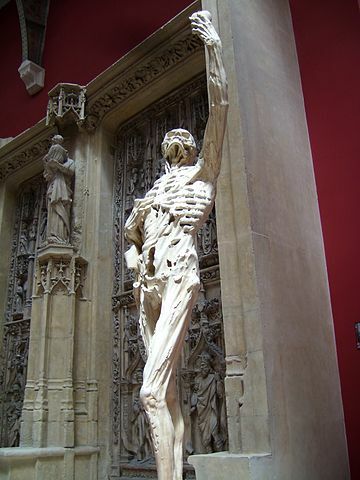 Richier presents him as an écorché , with his skin and muscles decayed, leaving him reduced to a skeleton. This apparently fulfilled his deathbed wish that his tomb depict his body as it would be three years after his death. His left arm is raised as if gesturing towards heaven. Supposedly, at one time his heart was held in a reliquary placed in the hand of the figure's raised arm. Unusually for contemporaneous objects of this type, his skeleton is standing, making it a "living corpse", an innovation that was to become highly influential. The tomb effigy is positioned above the carved marble and limestone altarpiece. The Panthéon is a building in the Latin Quarter in Paris, France. It was originally built as a church dedicated to St. Genevieve and to house the reliquary châsse containing her relics but, after many changes, now functions as a secular mausoleum containing the remains of distinguished French citizens. It is an early example of neo-classicism, with a façade modelled on the Pantheon in Rome, surmounted by a dome that owes some of its character to Bramante's Tempietto. Located in the 5th arrondissement on the Montagne Sainte-Geneviève, the Panthéon looks out over all of Paris. Designer Jacques-Germain Soufflot had the intention of combining the lightness and brightness of the Gothic cathedral with classical principles, but its role as a mausoleum required the great Gothic windows to be blocked. The Palais de Chaillot is a building at the top of the Chaillot hill in the Trocadéro area in the 16th arrondissement of Paris, France. A cadaver tomb or transi is a type of gisant featuring an effigy in the form of a decomposing corpse; it was particularly characteristic of the later Middle Ages. Anne of Burgundy, Duchess of Bedford was a daughter of John the Fearless, Duke of Burgundy (1371–1419) and his wife Margaret of Bavaria (1363–1423). Rambouillet is a commune in the Yvelines department in the Île-de-France in north-central France. It is located on the outskirts of Paris, 44.3 km (27.5 mi) southwest from the centre. Rambouillet is a sub-prefecture of the department. Pierre-Jean David was a French sculptor, medallist and active freemason. He adopted the name David d'Angers, following his entry into the studio of the painter Jacques-Louis David in 1809 as a way of both expressing his patrimony and distinguishing himself from the master painter. Charles René de Paul de Saint-Marceaux was a French sculptor. Louis-Pierre Deseine (1749–1822) was a French sculptor, who was born and died in Paris. He is known above all for his portrait busts and imaginary portraits. At the Salon of 1789, he showed a portrait head of Belisarius. Louis-Messidor-Lebon Petitot was a French sculptor, who was born and died in Paris. He was the pupil and son-in-law of the sculptor Pierre Cartellier. Aignay-le-Duc is a French commune in the Côte-d'Or department in the Bourgogne-Franche-Comté region of eastern France. Marie Alexandre Lenoir was a French archaeologist. 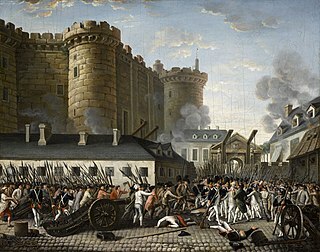 Self-taught and devoted to saving France's historic monuments, sculptures and tombs from the ravages of the French Revolution, notably those of Saint-Denis and Sainte-Geneviève. Charles Marie Émile Seurre or Seurre the Younger was a French sculptor. Onésime-Aristide Croisy was a French sculptor. He is known for his dramatic bronze military statues, but perhaps best known for his marble Le Nid, showing two children asleep in an armchair. Christ carrying the Cross is a 15th century polychrome and oak sculpture attributed to the French sculptor Ligier Richier in the Église de Saint-Laurent in Pont à Mousson in Meurthe-et-Moselle. It is thought to have come from the chapel of "Mount Olive" erected by Philippe de Gueldres in the garden of the Clarisses monastery in Pont-à-Mousson. ↑ Ariane van Suchtelen; Quentin Buvelot (2003). Hans Holbein the Younger, 1497/98-1543: Portraitist of the Renaissance. Mauritius: Royal Cabinet of Paintings. p. 144.